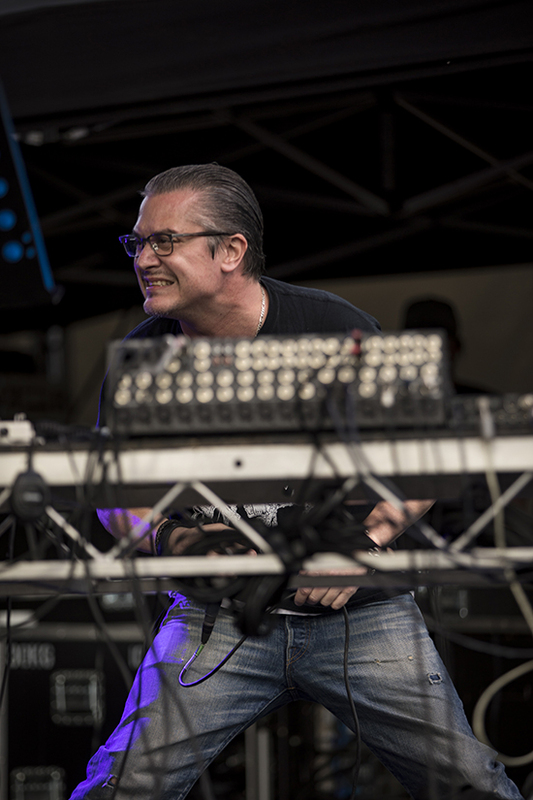 Curator Brian Ritchie’s exciting 2017 MOFO program seems to have sprouted from two very fertile seeds—two under-acknowledged pioneers of electronic music, British composers Daphne Oram and Delia Derbyshire. Oram and Derbyshire made revolutionary use of the development in the 1950s of the capacity to record sound onto magnetic tape and individually produced some of the most original and visionary electronic music ever created. This MOFO program explored electronic music from its early 20th century beginnings, with the invention of the Theremin and the ondes Martenot, to the latest applications of the analogue synthesiser, establishing the historical context for appreciating the significance of these pioneers in generating a new world of music and sound. As well as dozens of live indoor and outdoor performances over three days, the MOFO program included several cinematic works, among which was Geoffrey Jones’ short film Snow (1963), for which Oram (1925–2003), a co-founder of the BBC’s Radiophonic Workshop in 1958, provided the soundtrack. As well as sound effects for film and television, Oram composed works for performance, sometimes jointly with other composers, and her use of sine-wave oscillators with tape and filters anticipated the development of the analogue synthesiser. Kara Blake’s experimental film The Delian Mode (2009) portrays the life and work of Derbyshire (1937–2001), who joined the BBC Radiophonic Workshop in 1960 (after Oram had left) and who produced hundreds of electronic works, especially for BBC TV, including most famously the Doctor Who theme based on Ron Grainer’s score. Parisian ondes Martenot exponent and teacher Nadia Ratsimandresy gave some absorbing solo and other performances, notably with the dynamic Korean cellist Okkyung Lee and guzheng champion Mindy Meng Wang—a unique instrumental trio that produced captivating music. Ratsimandresy also guested with the duo Tasmanian guitarist Julius Schwing and Victorian sound artist Myles Mumford on electronics. For their work Rust and Thirst, Schwing and Mumford had suspended two rusty corrugated iron rainwater tanks, inverted to resemble giant bells, from the ceiling of the MONA winery and attached several transducers inside them. Performing as a duo or with guest musicians, they relayed their sound mix through the transducers to make the tanks vibrate and, with a mike placed underneath to feed the sound back into the mix, created an ethereal and quite haunting effect for the audience sitting under and near the tanks. Their enchanting set with Ratsimandresy was wonderfully coherent musically as well as symbolically powerful in evoking the arid Australian climate. Carolina Eyck, a theremin virtuoso from Germany, demonstrated the full capacities of her instrument with Jennifer Marten-Smith (piano) and Jim Moginie (guitar) in popular classics such as Rachmaninov’s Vocalise. She controlled the theremin’s whine with the slightest movement of a hand or finger to give it the character and subtlety of the human voice. Meanwhile, musically diverse performances using all kinds of synthesisers ran throughout the weekend. 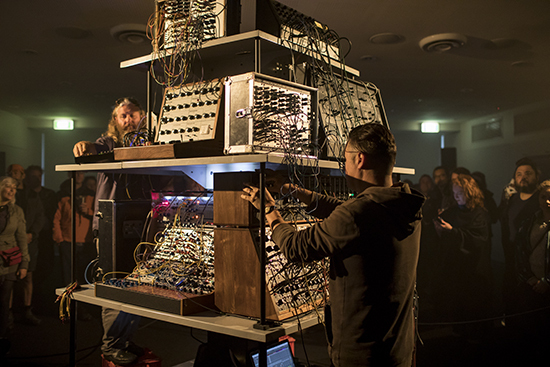 Robin Fox and Byron J Scullin, of Melbourne Electronic Sound Studio (MESS), created Tone Temple, in which they performed on a pyramid-shaped stack of early synthesisers and drum machines in homage to the analogue synthesiser revolution of the 1960s and 1970s. Scot Cotterell gave a solo performance for various synthesisers, and most outstandingly, MOFO featured US performer Kaitlyn Aurelia Smith’s delightful songs in which she morphs her own voice with rich electronic orchestration. Many solo performers used electronics and sometimes pre-recorded material to provide musical accompaniments to their own voices. Kelsey Lu, alternately playing cello and guitar, Circuit des Yeux (Haley Fohr) on guitar and Moses Sumney (guitar) gave fine solo performances using accompanying samples of various kinds, orchestrating as they went. All three are fine singer-songwriters. Lu’s soprano voice and Fohr’s extraordinary vocal range, from baritone to soprano and her brooding emotional power, stood out. Even so, in each case, I wondered if their music would have benefited from interaction with and the spontaneity of live accompanists. The sound of legendary Australian rock band Regurgitator, whose current lineup includes Seja Vogel (voice and synthesiser) and Mindy Meng Wang (guzheng), seemed more complete in their fine set. Tuareg singer-guitarist Mdou Moctar and his band delightfully rendered traditional Tuareg songs of West Africa, adapted for two electric guitars and drums with much less in the way of electronic mediation. 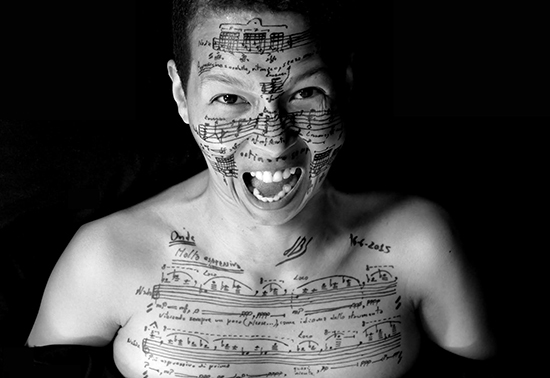 Tetema’s unforgettable performance provided the most powerful and eloquent use of electronics in the MOFO program. Tetema—Mike Patton (of Faith No More) and composer and multi-instrumentalist Anthony Pateras—were joined for this performance by Errki Veltheim (amplified violin and mandolin), Will Guthrie (drums) and for one piece, Scott Tinkler (trumpet). Pateras dexterously manipulated an array of synthesisers and a tape loop while Patton provided gymnastic vocals, alternating between two microphones, each of which was connected to a desk-full of sound processors that sampled and transmuted his voice. A headline act for MOFO, Tetema produced a high-voltage fusion of driving rock, jazz and electronica, with dazzling solos by Pateras, Veltheim and Tinkler that blew the enthralled audience off the manicured MONA lawn. Not all the MOFO program was concerned with the origins and nature of electronic music. Alim Qasimov and his ensemble gave an exquisite performance of traditional Azerbaijani music, preceded by a video that suggested that such musical traditions are sadly dying out. And Julian Day performed a characteristic keyboard work of his on a beautifully maintained 200-year-old pipe organ. Using heavy bolts to hold down selected keys, Day creates sequences of droning chords that induce a subtly evolving and meditative effect over 50 minutes, a composition that is musically characteristic of the electronic era but isn’t electronic. The curtain-raiser to MOFO was a performance of Before the Flame Goes Out: Memorial to the Jewish Martyrs of Ioannina, Greece, by Constantine Koukias who, until his recent relocation to Amsterdam, had for many years run the opera company IHOS in Hobart. The work is scored for soprano, ondes Martenot (Ratsimandresy again), violin, cello, piano and tape, and was staged in the Hobart Town Hall free of charge to the public. Set in Ioannina, the home town of the composer’s parents, Before the Flame Goes Out is in 10 parts in three languages and is accompanied by videos including archival footage from the Holocaust. This evocative work traces the history of a Jewish community in Greece that suffered under successive occupations over many centuries and was all but obliterated in the Holocaust, the few refugee survivors establishing a small community in New York. This story of the Romaniote Jews is a timely reminder of the plight of refugees generally and of the effects of bigotry and prejudice.